And so the charity shop bonanza continues: this weekend I was given Chess in Concert which cost 50p from the British Heart Foundation in Reading as it had no box! 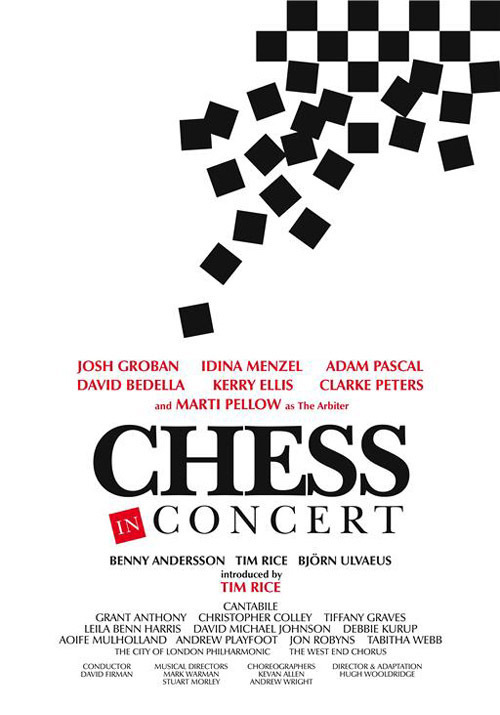 I’ve never actually seen Chess and so was mildly intrigued by the prospect of it especially as it featured Idina Menzel in the cast but the presence of Josh Groban and Marti Pellow had turned me off from previously engaging and I’m no great fan of Kerry Ellis either to be honest. But I gave the show, a concert version from the Royal Albert Hall in 2008, a try and found myself quite enjoying it despite everything. For the uninitiated, the music for Chess was written by Björn Ulvaeus and Benny Andersson of ABBA with lyrics by Tim Rice and is based around a love triangle between two players in the Chess World Championship and Florence, a woman who manages one of them but falls in love with the other: the Cold War dramatised through chess and set to music, how else could this story have been told?! On first time viewing though, I have to admit to being quite surprised at how effective it was at telling a rather intimate story whilst simultaneously capturing much of the paranoia and ill-feeling that characterised this ideological conflict. 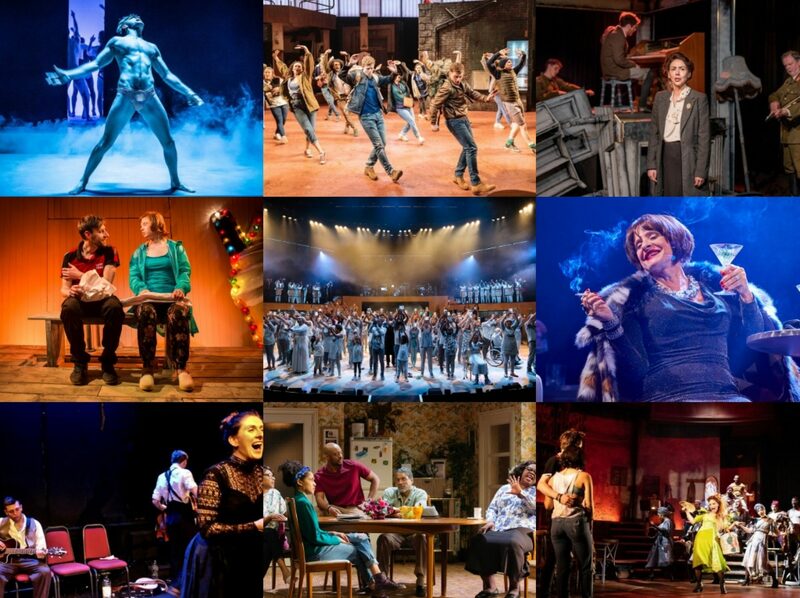 The concert was presented in a semi-staged format with some acting going on, a lot of short pieces of choreography muddling the stage and an ensemble singing into handheld mikes, fortunately the leads had headsets so they weren’t hampered by having to hold anything. I dislike the concept of Josh Groban more than the man himself, I can’t say I’ve knowingly heard him sing, and I thought he did quite well as tortured Russian grand master Sergievsky, seizing the opportunity to defect and allowing Idina Menzel’s Florence into his life, despite leaving a wife behind in Russia. I love Menzel but this role didn’t quite seem like the best fit for her, never sounding quite natural enough for my liking, though Nobody’s Side is an amazing 80s power ballad which became an immediate favourite and the one song I played over again (and most likely will download). Across the chessboard, Adam Pascal played his brash opponent well and in smaller parts, David Bedella’s Machiavellian Molokov, Clarke Peters’ equally conniving de Courcy and Kerry Ellis’ spurned Svetlana made strong impressions. I still can’t get used to seeing Marti Pellow onstage, something about him rubs me up the wrong way, and I did not care for his turn as the Arbiter who looked after the chess games. And there was great fun watching the ensemble performing behind seeing familiar faces like Jon Robyns and Tiffany Graves popping up providing vocal support. There were lots of things that I didn’t like though: the computer-animated graphics that took us between scenes looked cheap and reminded me more of The Crystal Maze than anything, completely unnecessary; the choreography just didn’t work for me, feeling rather cramped, distracting from the concert that I thought this was meant to be (though I suppose it could have evoked memories of a full production for fans…) and it is simply cringeworthy when executed by the (albeit enthusiastic) choir. Some of the songs felt horribly wrong too, I hate songs about places – they never work (see Sondheim embarrassing himself in Road Show) and here there’s a right pair, ‘Merano’ and ‘One Night in Bangkok’, both of which left me cold. But all in all, it was an amusing watch, definitely worth the 50p, and one which sucked me in for a time, to the point where I now wish I’d caught the actor-musician production that was recently touring.